This Christmas season, I wanted to make a contribution moderately more interesting than my usual iTunes gift card stocking stuffers. With that in mind, I decided to invent my own recipe, because I figure everyone’s gotta have their own recipe at some point. 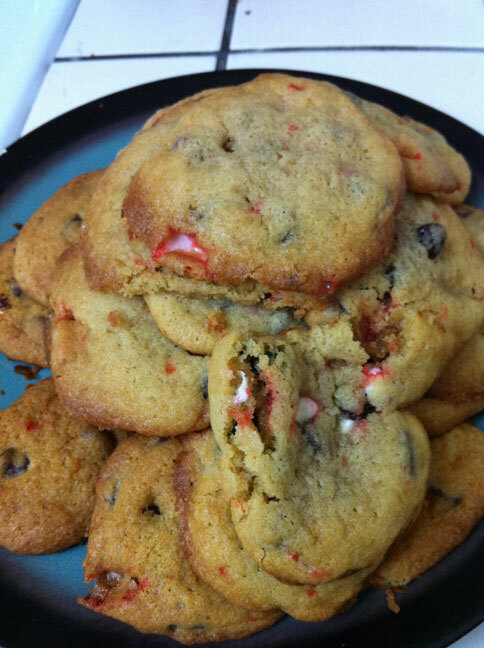 After many batches of tinkering, I ended up with this, a recipe for chocolate chip candy cane cookies! Combine flour, baking soda, salt and cinnamon in small bowl. Beat butter, sugar and vanilla extract in large mixer bowl until creamy. Add eggs, one at a time, beating well after each addition. Gradually beat in flour mixture. Crush candy canes to desired consistency, then stir in with chocolate chips. Drop by rounded tablespoon onto greased baking sheets. Let me know what you think of them! Everyone I surveyed thought they were pretty darn delicious, and also a good use for otherwise useless candy canes. Here’s the finished product!